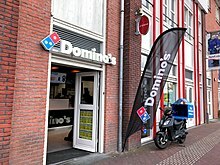 This list of pizza chains includes notable pizzerias and pizza chains. Pizza is a dish of Neapolitan origin and cuisine, made with an oven-baked, flat, generally round bread that is often covered with tomatoes or a tomato-based sauce and mozzarella cheese. Other toppings are added according to region, culture, or personal preference. A restaurant or takeout where pizzas are made and sold as main food is called a pizzeria (Italian pronunciation: [ˌpittseˈriːa]) or simply “pizza parlor” in English. The term pizza pie is a (mainly American) dialectal, and pie is used for simplicity in some contexts, such as among pizzeria staff.